Cheryl Campo as Gurt, Mrs. Mr. Mayor of Bluestown and cast. Photo by Bruce F. Press Photography. 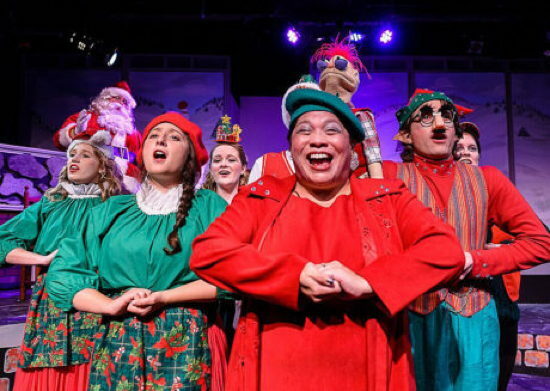 “Harry Connick Jr.’s The Happy Elf” is Red Branch Theatre Company’s final offering of their outstanding 2016 season. And what a fun-filled Christmas ride it is! The opening night audience was a great blend of young and old and, judging by the laughter and applause levels, the production was a crowd pleaser on all levels. I’ll admit I was not thrilled to be among them, until the opening number was underway. I have to confess I am definitely a convert. Connick is not nearly as well known for his songwriting as he is for his performances and – most recently – as a judge on American Idol. “The Happy Elf” started out as a single song on his Christmas album, was turned into a family friendly holiday cartoon offering, and finally was expanded into this iteration now on stage. …a production like “The Happy Elf” is something that the whole family can enjoy and forget about the real world for a little while. It’s the story of Eubie, a relentlessly upbeat elf who is constantly in trouble with his meanie of a supervisor, Norbert. When Eubie learns that Santa is going to take three elves with him on his annual toy distribution night of Christmas Eve, he sets out to prove to Santa that he is the most worthy of them all to be picked for that honor. To that end, he decides to convince the inhabitants of Bluestown, a sad and depressing coal town where everyone is on the naughty list, that they can find happiness and joy if they only try to ‘find the good in everyone and believe’. This being a holiday piece, you can pretty much guess at the happy ending. 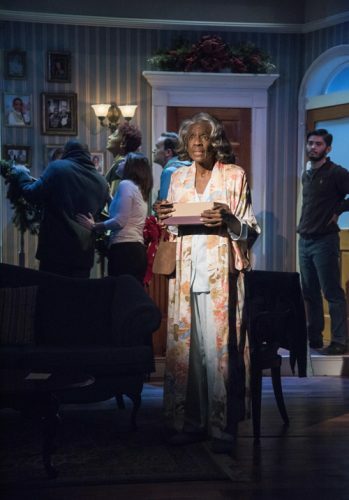 While the story breaks no new ground, the telling brings a heaping dose of holiday spirit to everyone who sees it. Director Laura Greffen keeps the action moving at a fast pace with a sure hand and a fine eye. This is a piece for children, obviously, and keeping their attention requires the action to be quick and constantly moving forward. Greffen does just that, bringing the show in at under two hours including intermission. Stephanie Lynn Williams and Amy Williamson attentively light the action, throwing in some impressive effects. The clever set by Gary Grabau includes a couple of miniature conveyor belts in the toy factory, and backlit panels that do double duty as backdrops for both the North Pole and Bluestown. Andrew Malone once again brings his talents to yet another production with his excellent costume designs. An unexpected pleasure was the outstanding choreography. Having designed countless dances for small stages, I know good work when I see it and Rick Westerkamp packs every dance number with professional panache. The entire cast has a great time playing larger than life characters and most appear both as elves in Santa’s workshop and denizens of Bluestown. As an ensemble, they dance and sing with an exuberance that gets feet a’tappin and hands a’clappin. Dan Allen Davis is a jolly old St. Nick and Adeline K. Sutter has a fine turn as Mrs. Clause. Sutter is nobody’s kindly, white-haired grandma in this version, but she’s fun to watch. Seth Fallon and his hand puppet (which looks like it escaped from Avenue Q) play the mean boss Norbert with just the right amount of naughty to make it awful nice to see. Cheryl Campo is a delight as Gurt, Mrs. Mr. Mayor of Bluestown. She can even make a song like “Poop Hole Song” sound good. Katie Ganem has a surprisingly lovely voice hiding behind her sullen poutiness as Molly, head mischief maker of Bluestown. Justin Moe’s Eubie is an over-the-top, flat-out joy as Eubie. His infectious grin, pointy ears, floppy hair and lanky movements put a smile on every face in the room (I checked.) This mega-watt entertainer is so well suited to this part that I’m pretty sure he could step into the cartoon version and not miss a beat. His fine voice on “Christmas Day” is touching and sweet, and his exuberance on others is spot-on for his character. Given some of the events we’re dealing with this holiday season, a production like ‘The Happy Elf’ is something that the whole family can enjoy and forget about the real world for a little while. A big thank you! to Red Branch Theatre for bring a little Christmas cheer to a world that can seem filled with way too many grinches lately. Running Time: 1 hour and 50 minutes including intermission. “Harry Connick Jr.’s The Happy Elf” runs through December 18th, 2016 at Red Branch Theatre, 9130-I Red Branch Road, Columbia MD 21045. For tickets, call (410) 220-6517 or click here to order online.